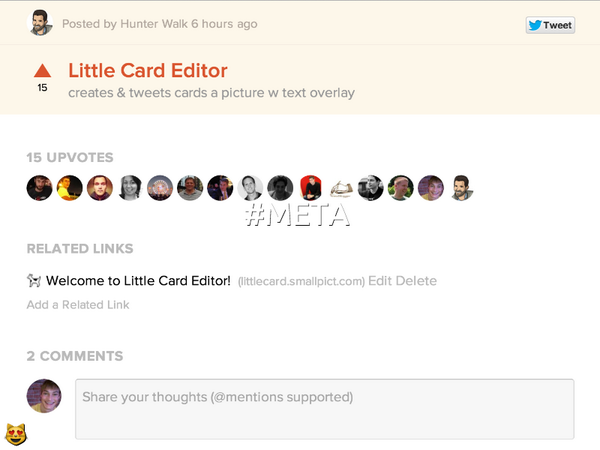 Would you recommend Little Card Editor to a friend? Another @davewiner creation! This is similar to @machinehuman's project, 200words. I think this is great for occasional use, but I fear what happens when a social media manager finds this. Yo, dawg... We need Product Hunt integration, @davewiner. This also reminds me of @Anderson760's Chisel, which provides a social feed of image + text creations. Add text & artwork to photos.